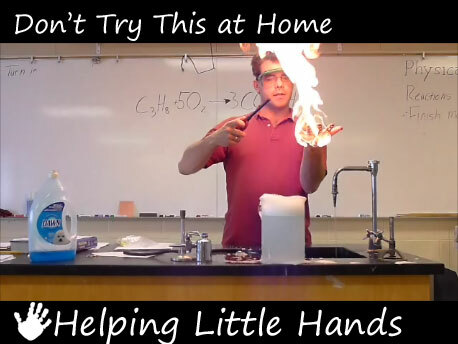 Or rather his hand appears to be on fire. There are flames around his hand, but his hand itself is not burning. Hubby was not harmed in the making of picture, although the picture is 100% real. Want to see how it he uses it to teach his chemistry students? If you're on Facebook, you can go here to see his video. Then make sure to "like" it! Hubby made the video as part of a contest to win $2500 in science equipment for his classroom. The teacher who gets the most "likes" on their video will win, so PLEASE share this video with all your Facebook friends (and make sure they know they have to click the link to go to the video itself, not just "like" your link to it.) I'm not embedding the video here...because I'd like you to go to Facebook to view it and "like" it. Hubby is currently in 1st place with almost 650 "likes", but we'd like a larger lead, since the contest is still running for a couple of weeks. We have had a few people say they can't see the video. The video is definitely there. From what we can tell, it's a problem with how specific people have their privacy settings set up on Facebook. AHHHHHHH! Wow! That is insane! So neat!!! Im sure his students loved that! Can we "like" the video more than once and have it count?